Tree Study to be Conducted in Park View Area | Park View, D.C. Upon returning home yesterday, I found a flyer on my door (and had seen them on many of the doors along my route home), introducing a forthcoming survey regarding urban trees (flyer below). 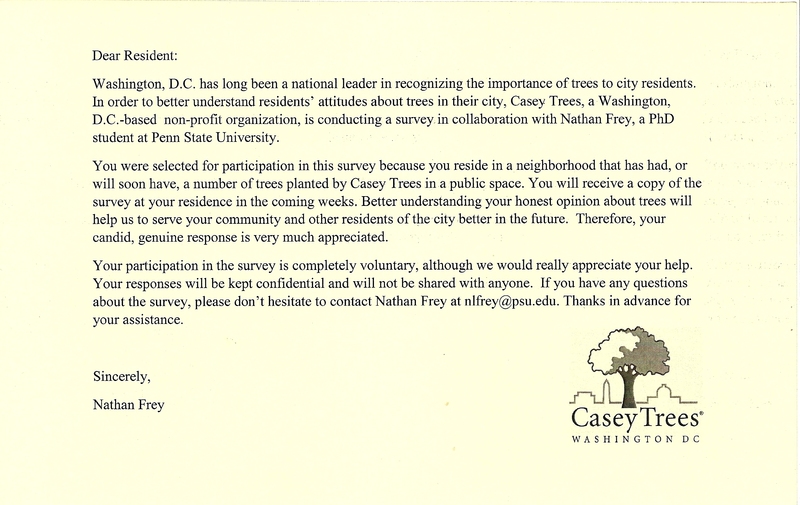 As the flyer states this is a collaboration between Casey Trees and Penn State University PhD candidate Nathan Frey, I’m curious to know more but have not had a follow up to my initial outreach. I was able to find Nathan Frey’s Curriculum Vitae and found it interesting that he gave a presentation in August at the Summer Meeting of ISA Research Committee 28 on Social Stratification and Mobility titled Demographic Disparities in Access to Urban Environmental Amenities: The Case of Washington, D.C.
I’m eagerly looking forward to learning more and participating in the survey and hope others who received the notice will participate as well. This entry was posted on October 21, 2015 at 7:01 am and is filed under Streets and Trees. You can subscribe via RSS 2.0 feed to this post's comments.